The Sun is surrounded by dust, forming a structure called the zodiacal cloud. It has been proposed that gravitational interaction of the dust with planets can lead to concentrations of dust forming circumsolar dust rings. The dust grains within the zodiacal cloud are primarily of cometary and asterodial origin [1,2] and range in size from 1 to 100 μm. The dust is trapped in orbital resonance with a planet and clusters into periodic patterns around the orbit. Multiple resonances can combine to form a dust ring, but structure in each resonance results in the azimuthal distribution of the ring being non-uniform. A circumsolar dust ring in the orbit of the Earth was first observed in the 1990’s with the COBE satellite [3, 4]. Photometry from the Helios mission  was consistent with a dust ring just outside the orbit of Venus, but could not be confirmed at that time. Here we describe the first observations of a circumsolar dust ring near the orbit of Venus using the STEREO/HI-2 imager . Figure 1. The viewing geometry (from ecliptic north) of a circumsolar dust ring at Venus from STEREO-B. Planet and STEREO spacecraft (A, B) positions are for 2008-Jun-12. . The STEREO/HI-2 imagers observe optical light originating at the Sun, scattered from interplanetary dust and is particularly sensitive to the zodiacal cloud. In order to observe the circumsolar dust ring, 10 days of HI-2 images were combined giving an integrated exposure time of around 8 days. The geometry of the STEREO spacecraft and the Venus circumsolar ring can be seen in Figure 1. 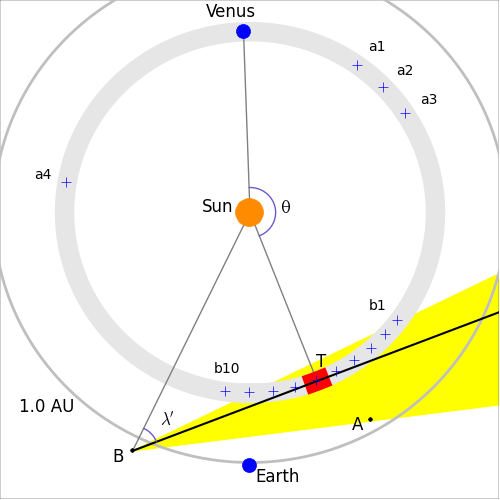 A ring at the orbit of Venus is viewed tangentially from STEREO-B along a line of sight through a point T (region shown in red in Figure 1.). Observing along the tangential part of the ring gives a stronger (yet still faint) signal due to integration along a segment of the ring, allowing detection in the STEREO/HI data. Similarly STEREO-A can observe a different part of the circumsolar ring. As the STEREO spacecraft orbit the Sun, they are able to observe different parts of the circumsolar ring. The brightness of a region of the sky with ecliptic latitude (β) from -8.5° to 8.5° and helioecliptic longitude (θ) from 35° – 60° (STEREO-A) or -60° – -35° (STEREO-B) is observed. In Figure 1, crosses indicate the locations of T in the observations presented here. The start dates of the STEREO-A data sets are: (a1) 2009-Jun-09, (a2) 2009-Jun-29, (a3) 2009-Jul-19, (a4) 2008-Nov-12. There are ten consecutive sets of STEREO-B data: (b1) 2008-Apr-18 to (b10) 2008-Jul-17. The regions of interest in the HI-2 images were binned with bin sizes of 0.5° in helioecliptic longitude (θ) and 1° in latitude (β). Data with high values corresponding to the background star field are discarded, and a box-car filter (of width 6.5° in helioecliptic longitude, θ) that takes into account the power law behaviour of the F-corona  removes the smooth distribution of scattered light from the zodiacal cloud. 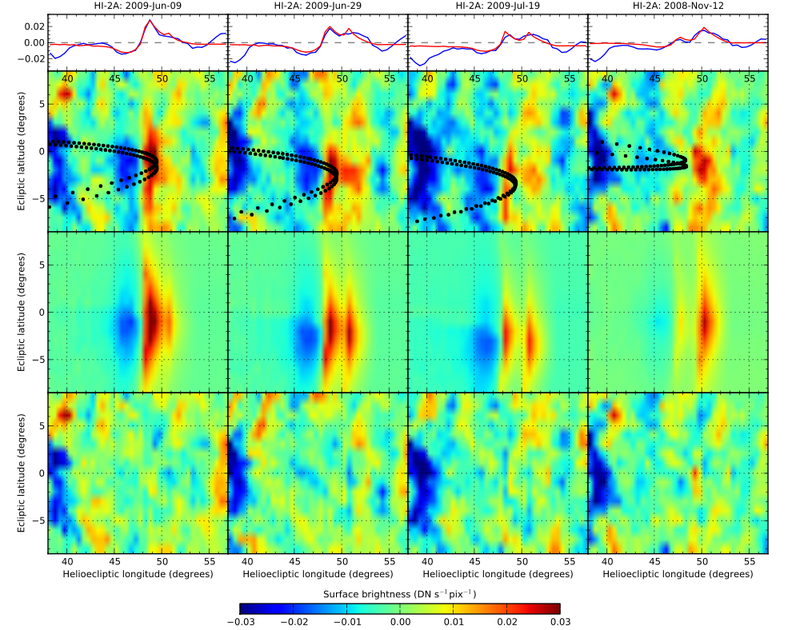 This produces a map of intensity variations that can be used to identify the dust ring. Figure 2. A bright feature near the orbit of Venus and its change of position with varying heliocentric distance with the STEREO-B spacecraft . Figure 2A shows an example map corresponding to the tangent point b6 (red box) in Figure 1. The two dotted curves indicate the orbit of Venus, one is the orbit at the beginning of the 10 day period and the other at the end (they change due to motion of the spacecraft). A clear enhancement in the signal can be seen at the tangent of the orbit. This enhancement is interpreted as being due to the circumsolar dust ring. 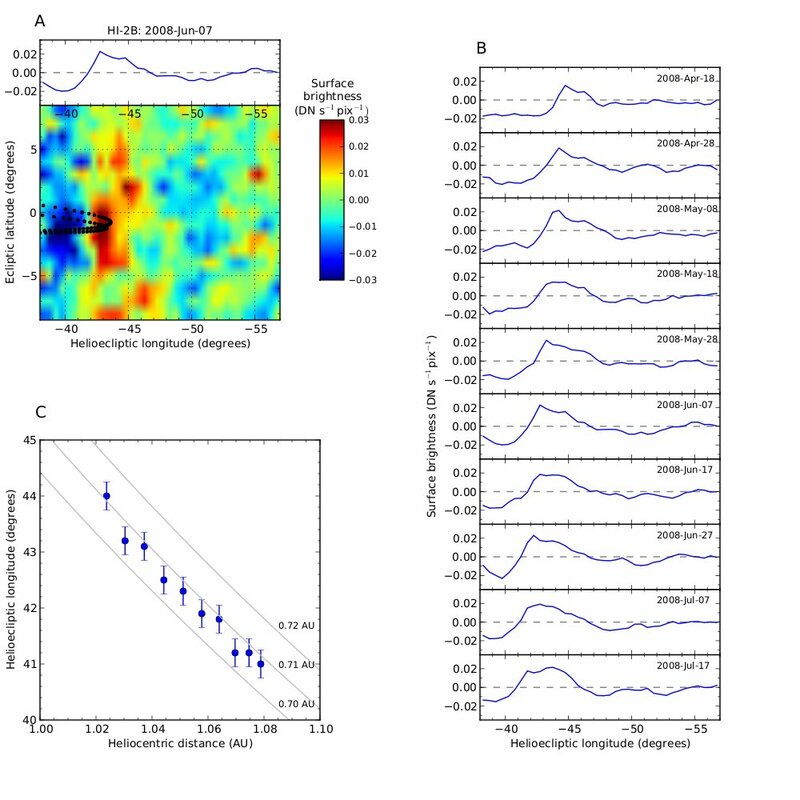 Figure 2B shows a series of mean scans (which are found by averaging the map intensities over latitude |β|<4.5°) along the ecliptic for the observations b1 – b10. In each case an enhancement is evident, confirming the persistence of the signal along a segment (~60°) of the orbit of Venus. Figure 2C shows that the longitude of the peak of the signal varies as would be expected given the change in heliocentric distance of the STEREO-B spacecraft, and is consistent with a physical ring close to the orbit of Venus. Figure 3. 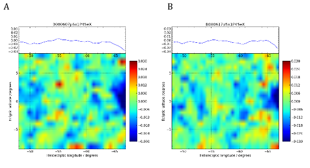 Intensity maps from STEREO-A (A) and STEREO-B (B) of the same tangent point of the circumsolar ring . Figure 4. Intensity maps of portions of the sky away from the orbit of Venus. (A) Map from STEREO-A and (B) map from STEREO-B . 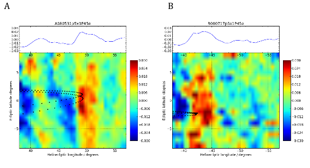 Figure 3 shows observations from both STEREO-A and STEREO-B corresponding to the same tangent point (θ=170°) as the 2008-Jul-17 STEREO-B data. An extended feature is observed close to the orbit of Venus by both spacecraft supporting the view that it arises from a physical structure at this location. Figure 4 shows a region on the ecliptic plane away from the orbit of Venus from STEREO-A (A) and STEREO-B (B). These do not contain intensity enhancements at the same level as seen at the orbit of Venus, illustrating that the ring enhancement is significant. Figure 5. Intensity mean scans (first row), intensity maps (second row), model maps (third row) and residuals (fourth row) for HI-2A datasets in other locations about the orbit of Venus . Figure 5 shows maps from points a1 – a4 in Figure 1, i.e. STEREO-A data of the circumsolar ring. These again show clear enhancements at the tangent point of the Venus orbit, confirming existence of the ring at other locations about its arc. A simple parametric model of the ring (third row) is fitted, showing good correspondence with the enhancement seen in the data, and subtracting the model from the data (fourth row) shows little residual signal. In this nugget we have shown STEREO/HI-2 observations that, for the first time, have imaged a circumsolar dust ring near the orbit of Venus . The ring has been observed in a continuous 60° arc with STEREO-B, and at additional locations about the ring with STEREO-A. A model fit to the data shows good correspondence to the scans. Additionally, a portion of sky away from the orbit of Venus does not show enhancements to the same level as that of the ring. Any of the individual maps shown are not necessarily compelling in their own right, but taken together they provide clear-cut evidence of the existence of the circumsolar ring near the orbit of Venus. The detection of this faint dust ring shows how the excellent sensitivity of the UK-led HI instruments, required to observe CMEs in the heliosphere, means that they can be used to explore other faint structures in the inner solar system. D. Nesvorný, P. Jenniskens, H.F. Levison et al. Astrophys. J. 713, 816 (2010). M. Rowan-Robinson, B. May, Mon. Not. Roy. Astron. Soc. 429, 2894 (2013). S. F. Dermott, S. Jayraraman, Y. L. Xu, B. Å. S. Gustafson and J. C. Liou, Nature 369, 719-723 (1994). W. T. Reach, et al. Nature 374, 521-523 (1995). C. Leinert, B. Moster, Astron. Astrophys. 472, 335-340 (2007). M.H. Jones, D. Bewsher, D.S. Brown, Science 342, 960-963 (2013). S. Koutchmy, P. L. Lamy in ‘Properties and interactions of interplanetary dust’, R. H. Giese, P. Lamy, Eds. (Reidel, Dordrecht, 1985). pp. 63-74.